Bathtubs! Showers! Running Water! Water Heaters! Just a hint of the 21st-century comforts I appreciate every single day…without lugging a single bucket of water. Indoor plumbing came about (at least for the wealthy, in urban areas) much earlier than one might think. This humorous caricature was drawn prior to an 1860’s publication in London. 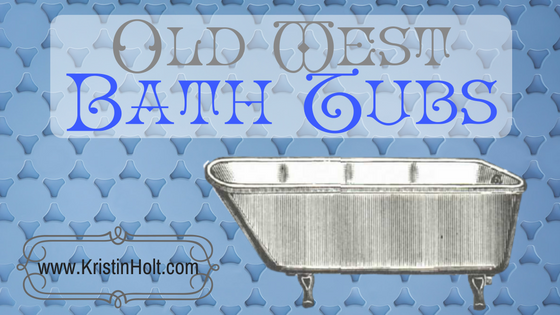 The mid-nineteenth century bathtub looks recognizable! From Four Hundred Humorous Illustrations by John Leech (29 August 1817 – 29 October 1864 in London), published in London (186-?) by Simpkin, Marshall, Hamilton, Kent & Co, and Glasgow: Thomas D. Morison. Find the whole text on Archive.org. 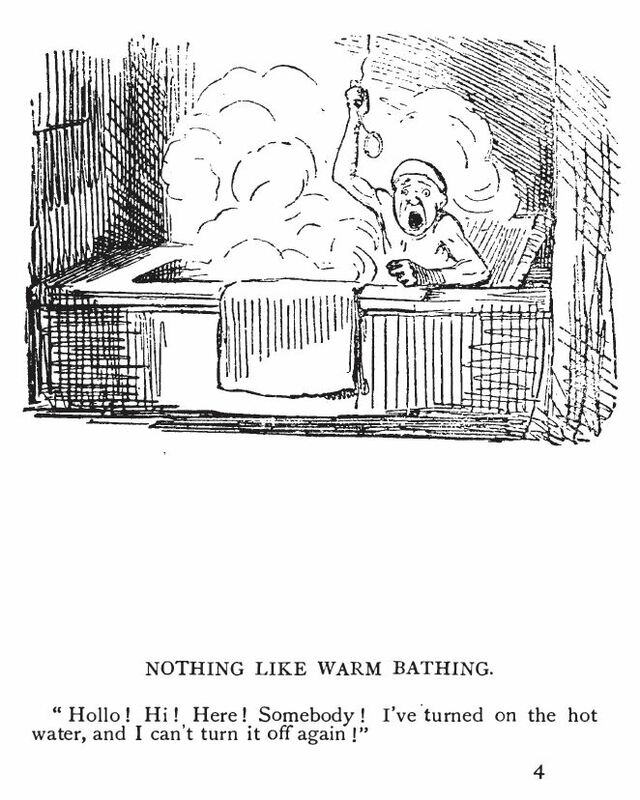 The same Four Hundred Humorous Illustrations publication contained this “funny”/ caricature illustrating the “Shower Bath”, stall-style, in London. 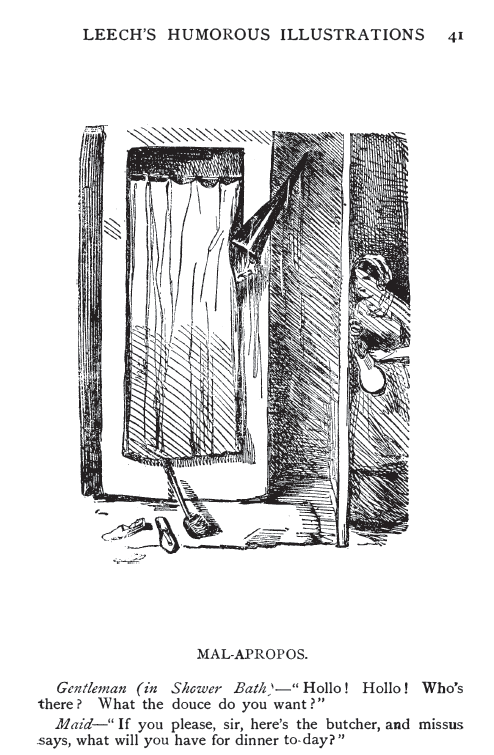 Common enough that Leech’s readers would find the interruption of a man’s ablutions amusing. Leech died in 1864, so this sketch could not have been made after that date. 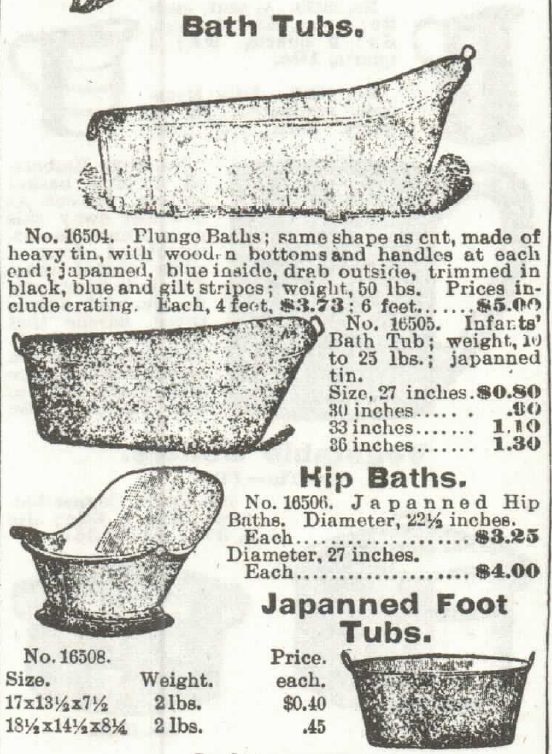 Sears, Roebuck & Co. and Montgomery, Ward & Co. Catalogs offered claw-foot bathtubs (stationary) near the turn of the century but were available (outside of the catalogs earlier). Iron Bath Tubs–with optional hardwood RIM of oak or cherry. 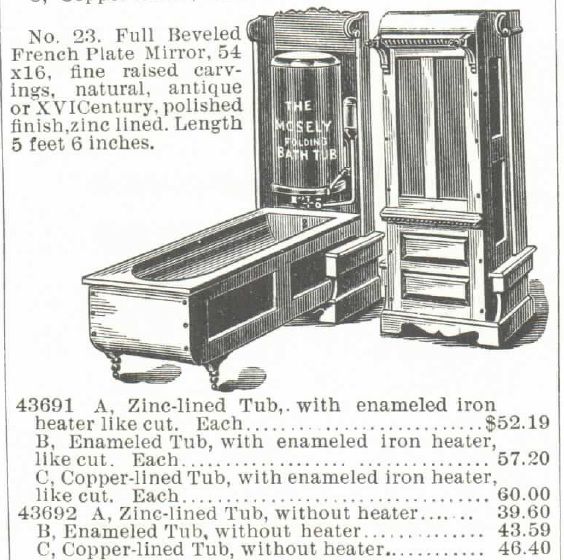 Montgomery Ward & Co. catalog, 1895. Our $10.95 Stationary Bath Tubs. Sears, Roebuck & Co. Catalog, 1898. Our $17.75 Bath Tub. Sears, Roebuck & Co. Catalog, 1898. 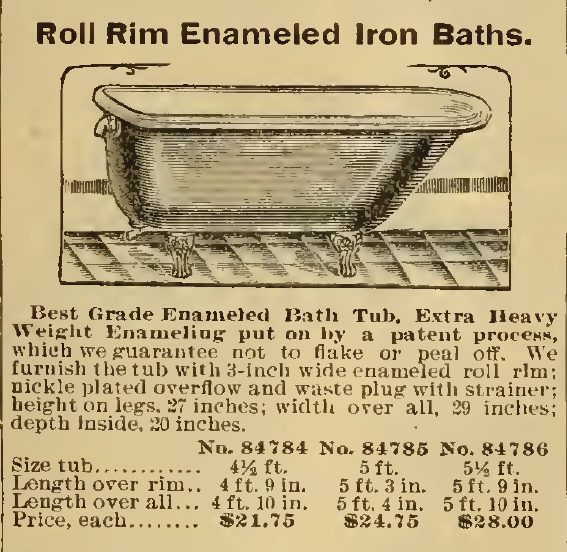 Roll Rim Enameled Iron Baths. Sears, Roebuck & Co. Catalog, 1898. 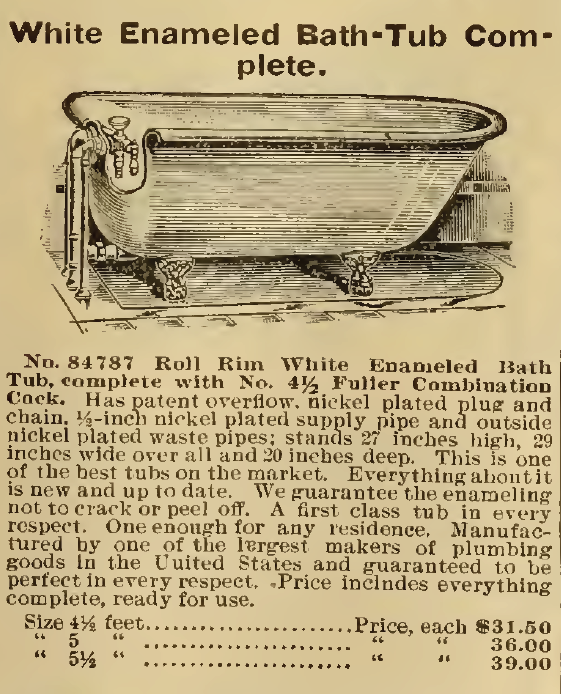 White Enameled Bath-Tub Complete, for sale in Sears, Roebuck & Co. Catalog, 1898. Bath Tub Plugs, sold separately, typically for replacement. Sears, Roebuck & Co., 1898. Bath Thermometer, for sale by Sears, Roebuck & Co. Catalog, 1898. 1890’s bathroom from the Clay County Museum in Henrietta, Texas. Image via Pinterest. 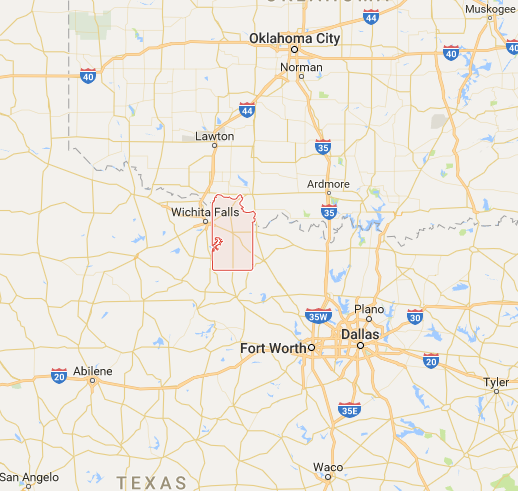 Clay County (outlined and shaded with red, near center of image), Texas is situated along the very northern border of the state, abutting Oklahoma. Image: Google Maps. 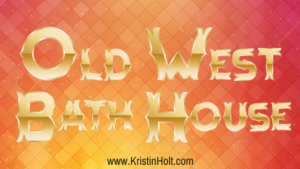 Clay County, Texas was absolutely “Old West”. But 1890’s had become quite modern. The house Richard Cannon built for his mail-order bride, Lessie, was a legitimate house plan of the time. That book was set in 1890, in Ogden, Utah–a significant hub of the transcontinental railroad, so anything anyone could afford could be easily shipped in or manufactured with raw materials (also carried in by rail). Many Western folk were wealthy and could afford the best of everything. Men made their fortunes with the railroad, in mining, in lumber, in ranching– and in providing supplies for all of the above. Yet far more men (and families) were poor than wealthy. Farmers crossed their fingers, prayed, worked 16+ hour days…and sometimes crops failed and they couldn’t make the mortgage. No wonder people managed with significantly less expensive options. Because of the effort involved in pumping water (or hauling it by hand-crank out of a well), carrying (both directions–in and out), heating, all the fuel used to heat the water, getting out the tub, etc., many pioneers on the western frontier / Old West would bathe literally out of a bowl, except for once-a-week Saturday night baths where every member of the family often used the same bathwater. 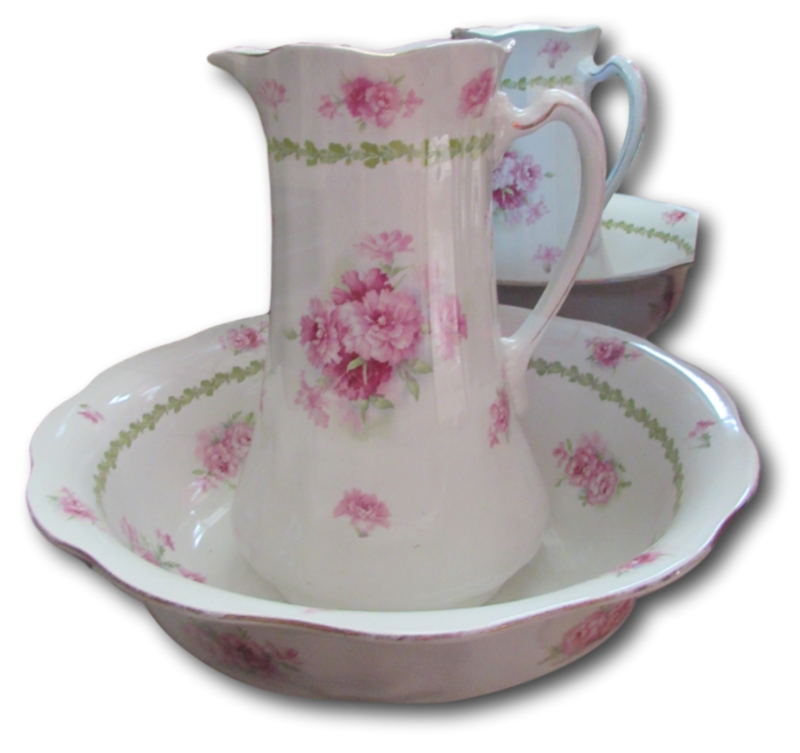 Bowl and Pitcher, Toilet Stand, for sale in the Sears, Roebuck & Co. catalog of 1897. 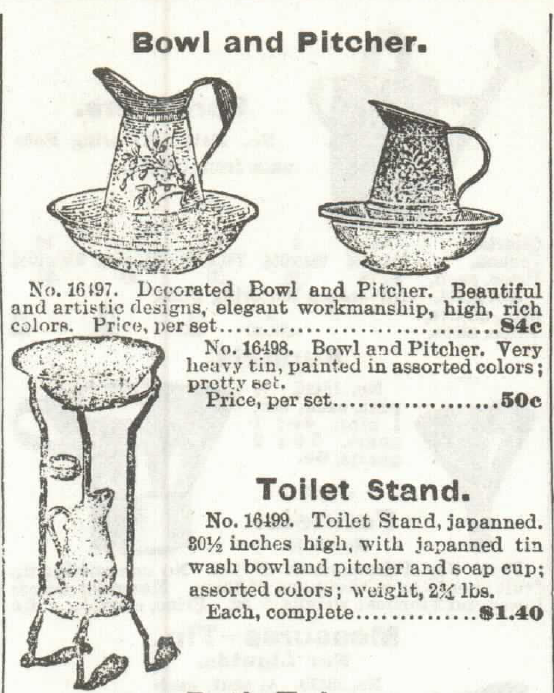 Wash Bowls, Pitchers, and Japanned Toilet Stands, for sale in the Montgomery, Ward & Co. 1895 Catalog. 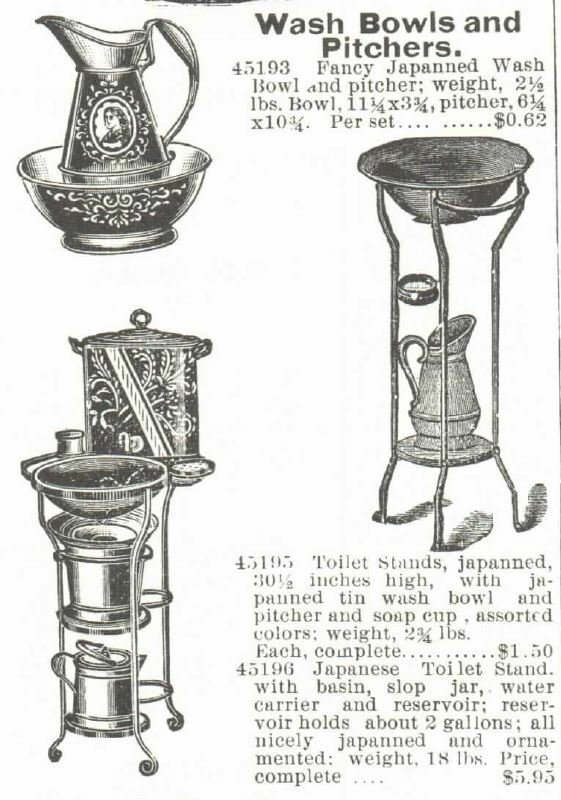 Note: Both Sears and Montgomery, Ward & Co. item listing mentions “japanned” toilet stand, and “Japanese Toilet stand”. 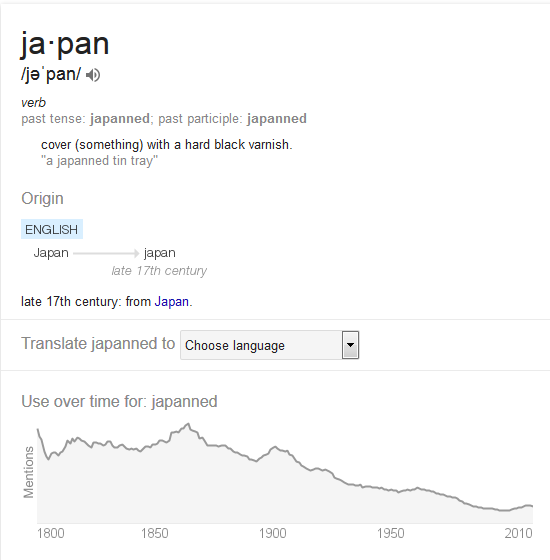 Definition of “japan” and the verb: “japanned”, according to Google. Note the high use throughout the nineteenth century. 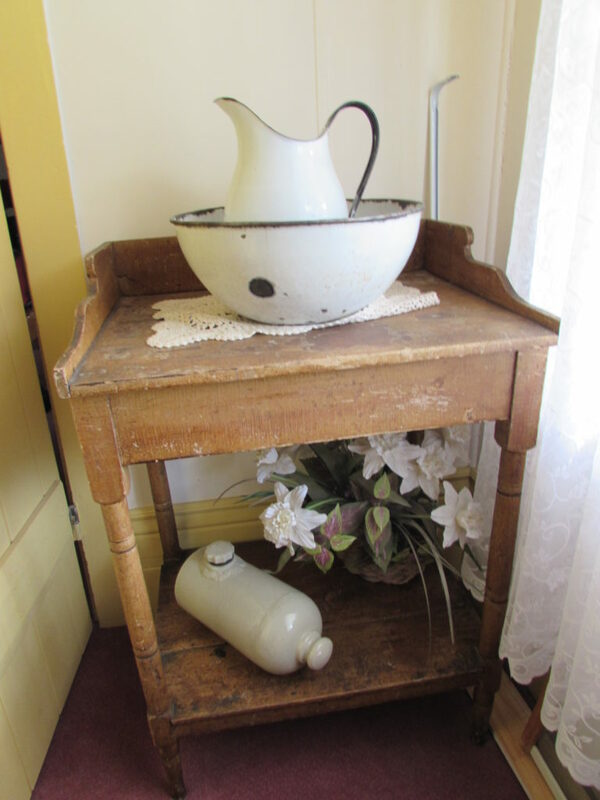 Antique Bowl and Pitcher on washstand. In guest room at the Historic Silver City’s Idaho Hotel. Image: taken by Kristin Holt, June 2016. Note: the pale-colored item on the lower shelf is a bed warmer, a bottle-like stoneware device to be filled with boiling water and used to warm the bed on a cold winter’s night. Antique china bowl and pitcher photographed behind a glass display case (against a mirror background) by Kristin Holt, June 2016, at the historic Silver City Idaho Hotel. 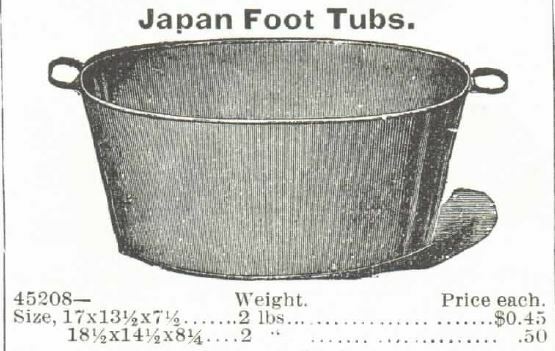 Japan Foot Tubs, for sale in the Montgomery, Ward & Co. 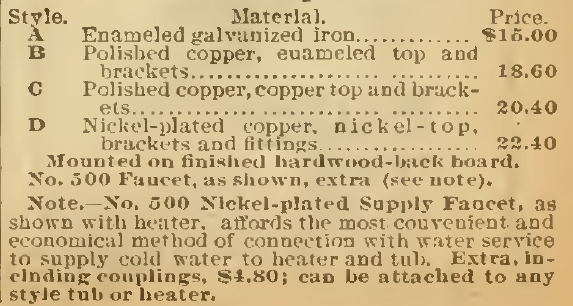 Catalog in 1895. Representative of items available and used throughout the era. 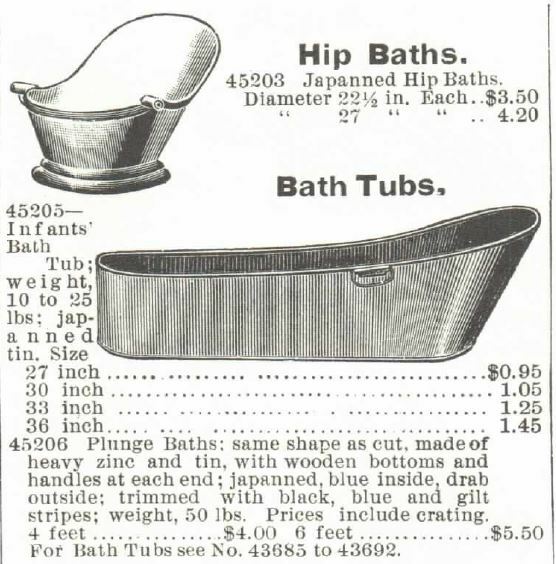 Hip Baths (that’s all that fits–the hips) and Bathtubs for infants (note item #45205), also 4 foot-bathtubs and 6-foot bathtubs, available for sale in the Montgomery, Ward & Co. Catalog of 1895. 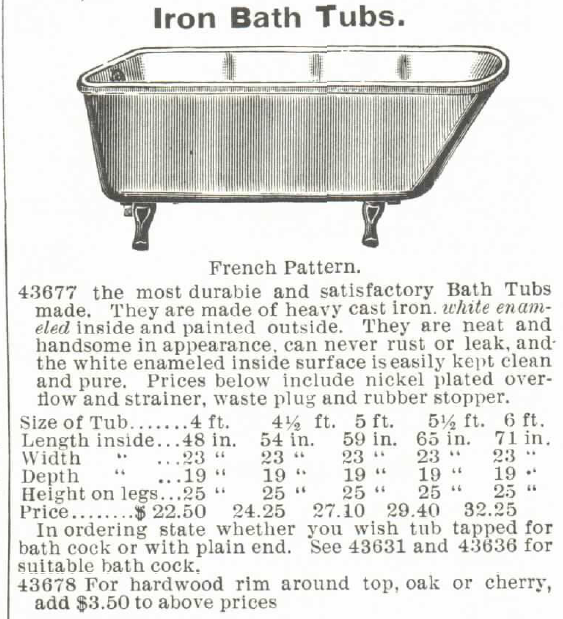 Can you imagine wrestling a 4-foot or 6-foot bathtub–dry weight–into position for use? Filling, then emptying? What about storage between weekly uses? 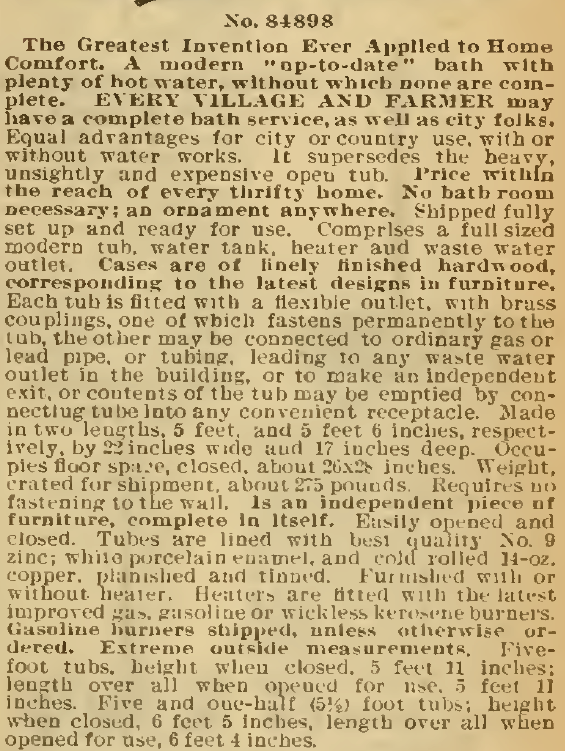 Bath Tubs, including hip baths, for sale in Sears, Roebuck & Co. Catalog in 1897. Oval Foot Tubs. Sears, Roebuck & Co., 1898. 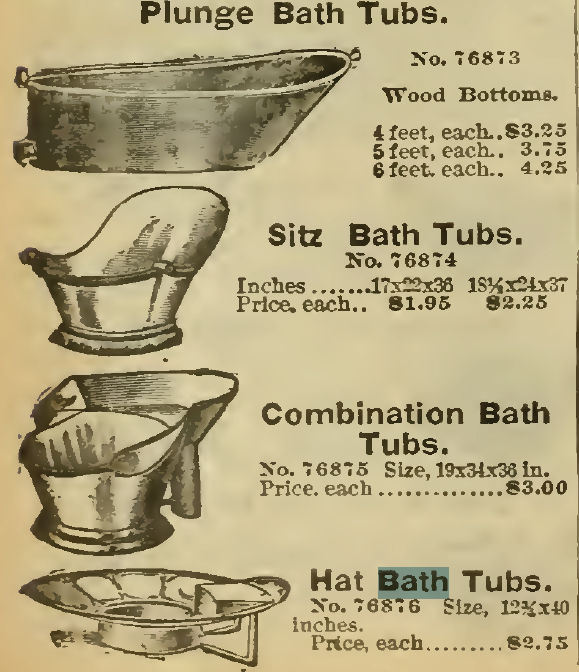 Plunge Baths, Sitz Baths (Hip Baths), Combination Bath Tubs, and Hat Bath Tubs. Sears, Roebuck & Co. 1898. 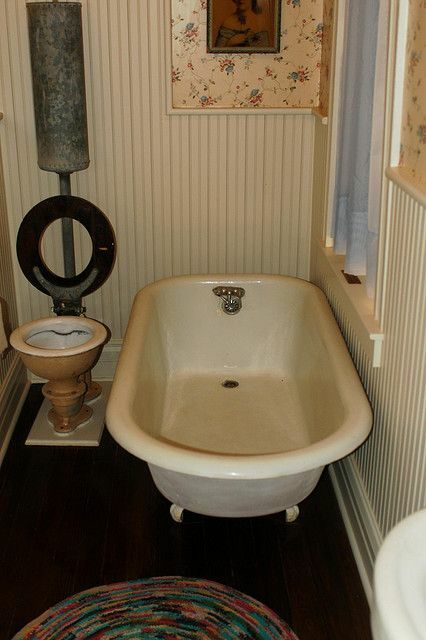 In my article about Indoor Plumbing (and the greater timeline), I shared this image of the tub in the bathroom of the Flavel House Mansion. 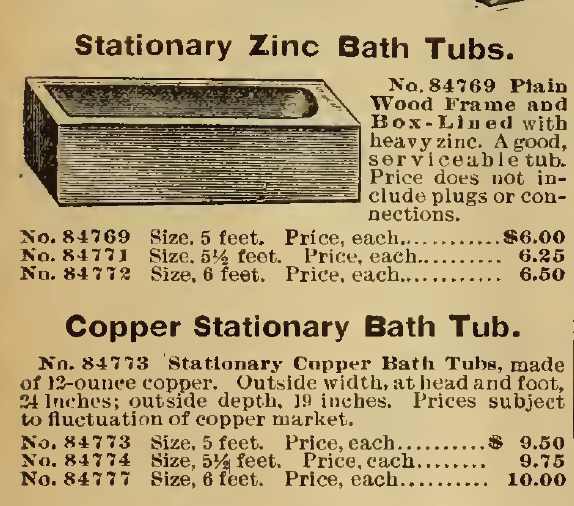 Stationary Zinc Bath Tub and Copper Stationary Bath Tub, in the Sears, Roebuck & Co. Catalog of 1898. 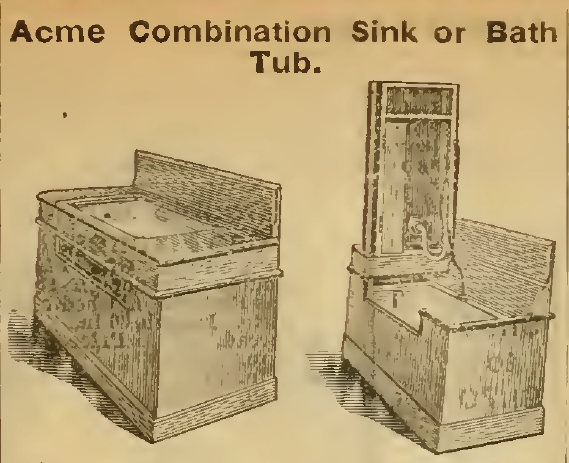 Acme Combination Sink and Bath Tub, Sears Roebuck & Co. 1898. 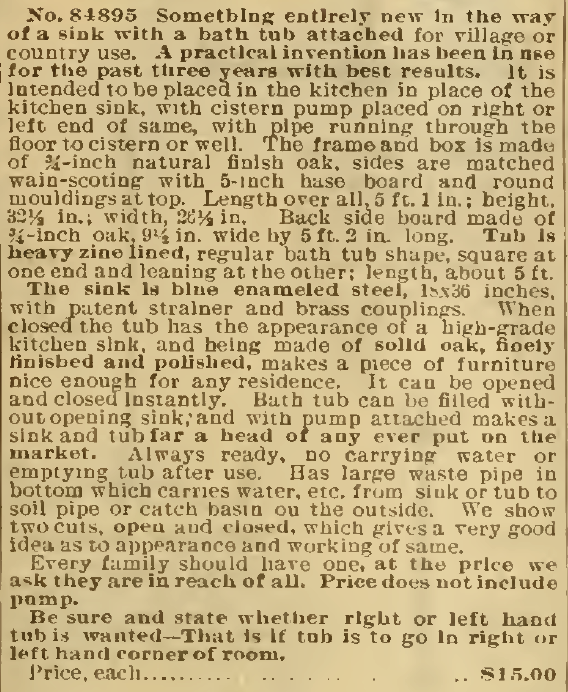 Acme Combination Sink and Bath Tub, part 2, Sears, Roebuck & Co. Catalog, 1898. This bathtub stood up against the wall to save floor space when not in use. 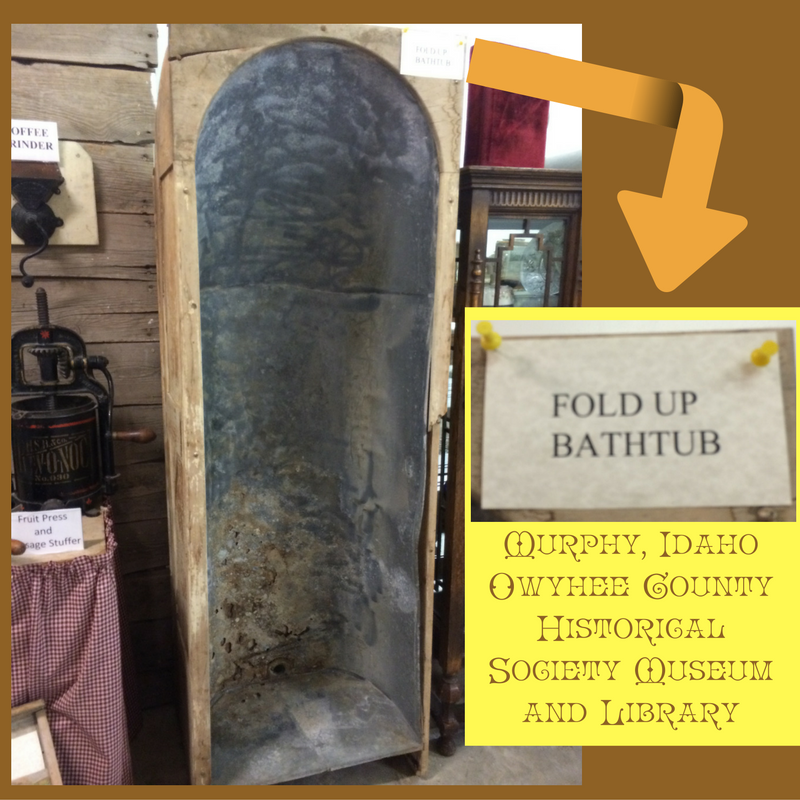 Images taken by Kristin Holt at the Murphy, Idaho Owyhee County Historical Society Museum, June 2016. This tub at the museum had no cabinet such as the options shown below. 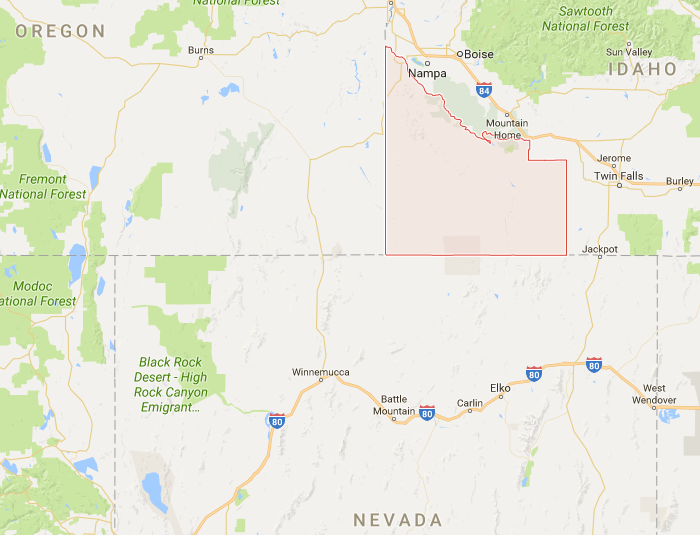 Owyhee County, Idaho, in the south-western corner of the state, abuts the borders of Oregon and Nevada. Image: Google Maps. Note: Owyhee County is where historic (“ghost town”) Silver City is, a location rich in 19th century mining history. The museum focuses on the 19th century history of many such boom towns in this county high in the Rockies. ADVENT OF SELF-CONTAINED WATER HEATERS! 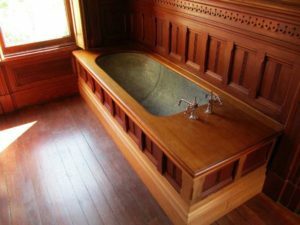 I’ve toured museum houses from the late Victorian era that have metal bathtubs built into the cabinetry (such as the tub in the Flavel House Mansion) with its own water heater in the same cabinet, accessed behind a panel (for repairs or replacement). Built-in tubs weren’t alone in the marvelous new advent of self-contained water heaters that did away with lugging pans of heated water from the kitchen stove. 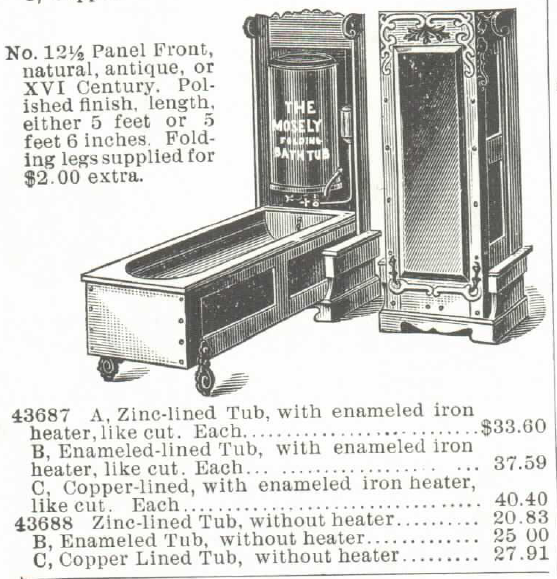 The Mosely Self-Heating Folding Bath Tub and Water Heater (for Gas or Gasoline). For sale in the Montgomery Ward & Co. Catalog of 1895. Part 1 of 5. 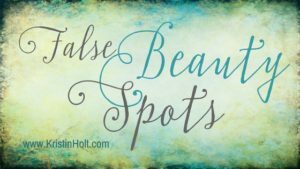 The many benefits outlined include the ease in adding this piece of furniture to an apartment (without a true bath room), no cutting of carpet, no need to affix to wall, free-standing, easy to lower and raise. Apparently would be appropriate for a bedroom in an apartment where the luxury of a full bath is desired but a rental agreement would not allow for bolts into the wall. 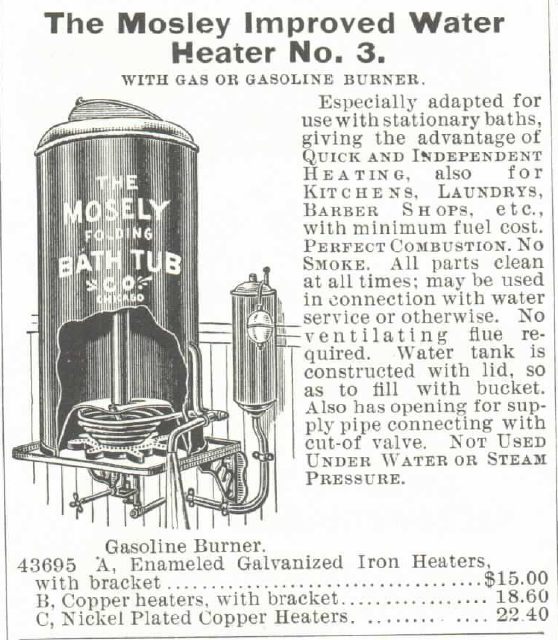 “GOOD.” The Mosely Self-Heating Folding Bath Tub and Water Heater (for Gas or Gasoline). For sale in the Montgomery Ward & Co. Catalog of 1895. Part 2 of 5. “BETTER.” The Mosely Self-Heating Folding Bath Tub and Water Heater (for Gas or Gasoline). For sale in the Montgomery Ward & Co. Catalog of 1895. Part 3 of 5. 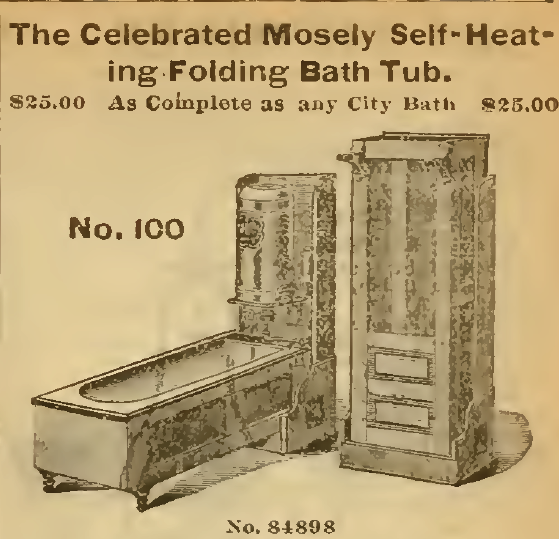 “BEST.” The Mosely Self-Heating Folding Bath Tub and Water Heater (for Gas or Gasoline). For sale in the Montgomery Ward & Co. Catalog of 1895. Part 4 of 5. 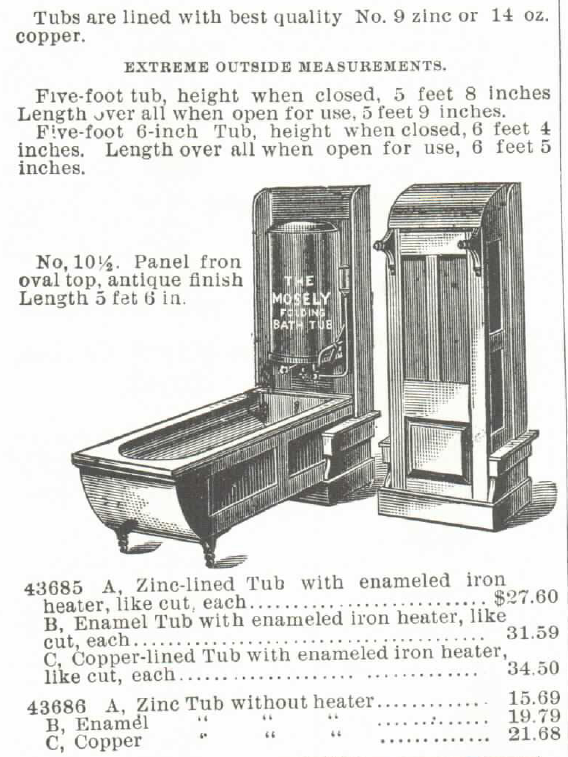 “TOP-OF-THE-LINE.” The Mosely Self-Heating Folding Bath Tub and Water Heater (for Gas or Gasoline). For sale in the Montgomery Ward & Co. Catalog of 1895. Part 5 of 5. Self-heating Folding Bath Tub. Sears, Roebuck & Co., 1898. 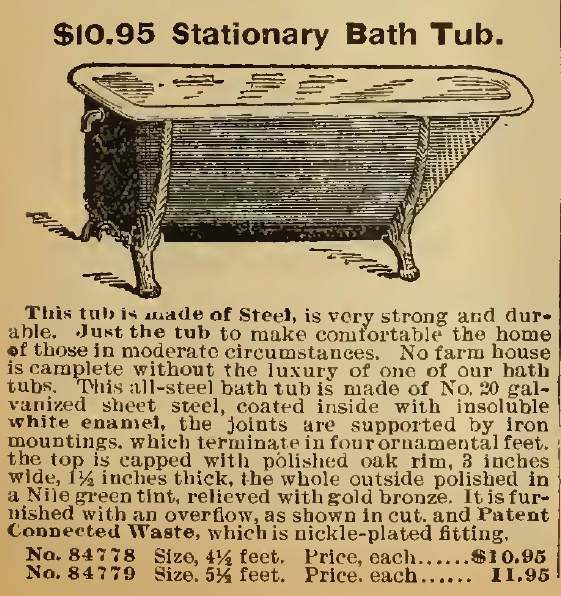 Self-heating bathtub, part 2, Sears, Roebuck & Co. 1898. 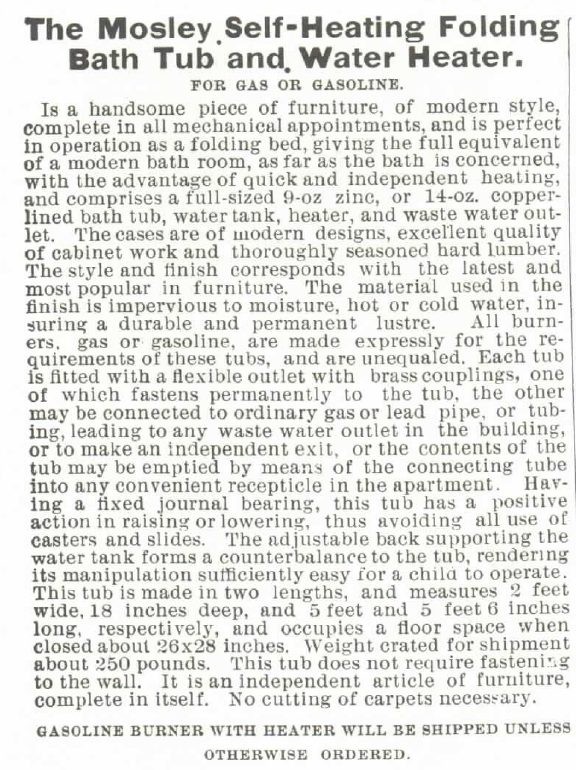 Self-heating bathtub, part 3, Sears, Roebuck & Co. 1898. 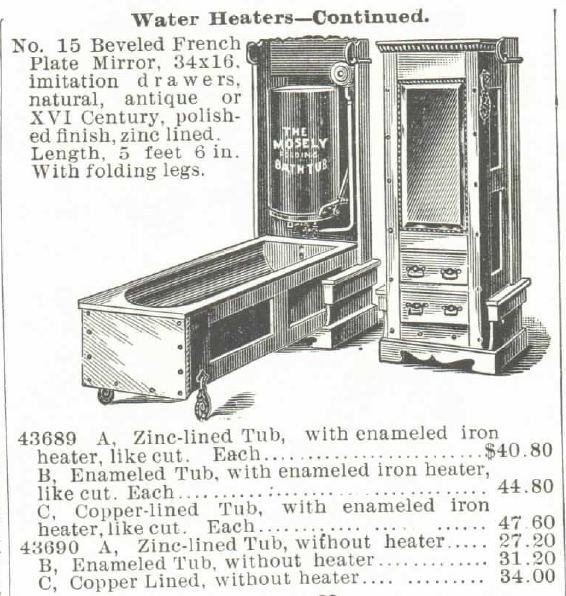 Mosely Water Heater for bathtubs, Improved Model #3 for sale in the Montgomery Ward Catalog of 1895. 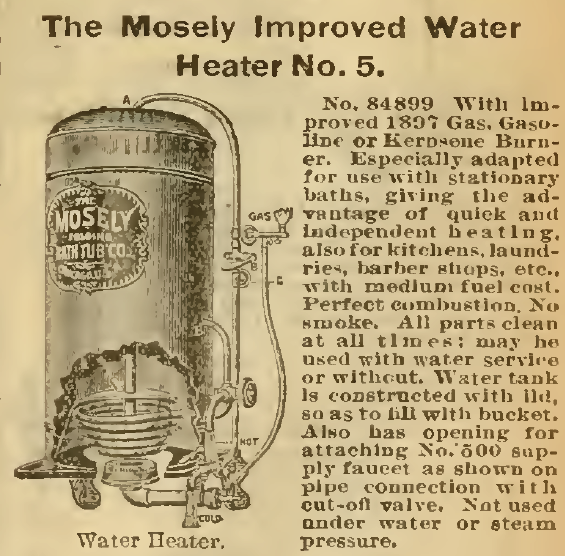 The Mosely Improved Water Heater, No. 5, from the Sears, Roebuck & Co. Catalog, 1898. Mosely Improved Water Heater, Part 2. 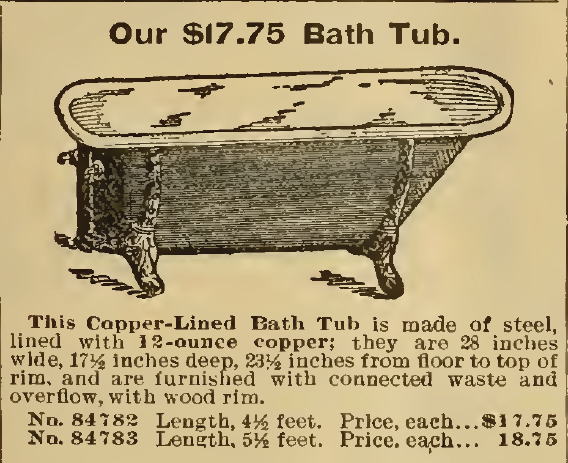 The Shower Bath, Part 1, Sears, Roebuck & Co. Catalog 1898. The Shower Bath, Part 2. 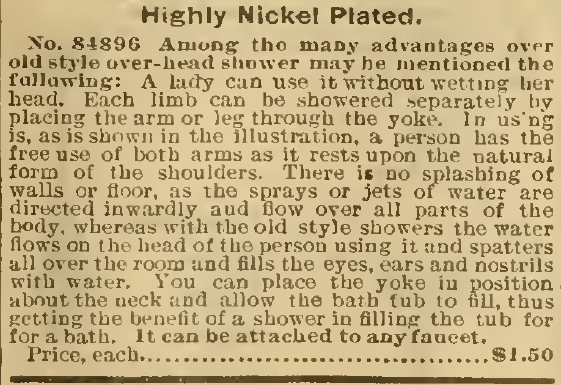 Note that the detailed information mentioned an “old style over-head shower”. “Showers” had been around since at least the Regency period in England. 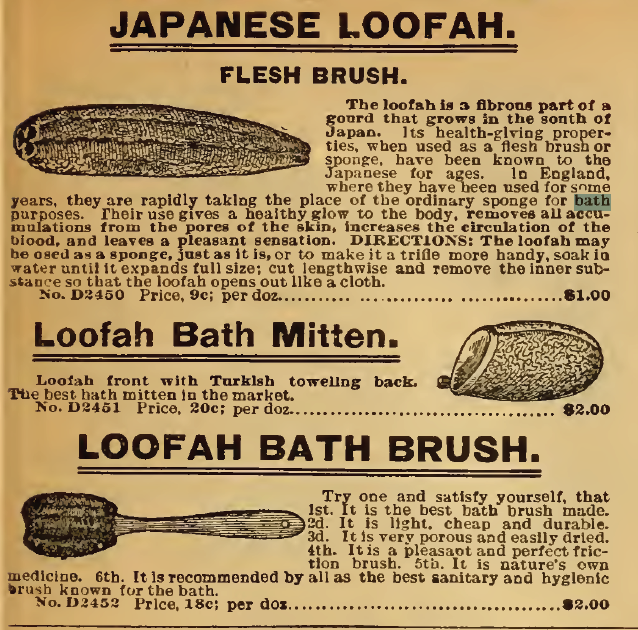 Japanese Loofah Bathing Sponges and Bath Brushes. Sears, Roebuck & Co. 1898. 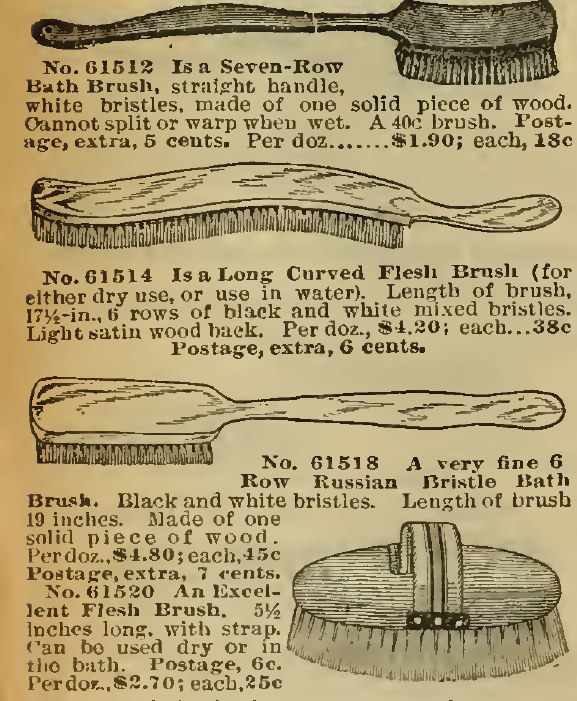 Bath Brushes in the Sears, Roebuck & Co. Catalog, 1898. 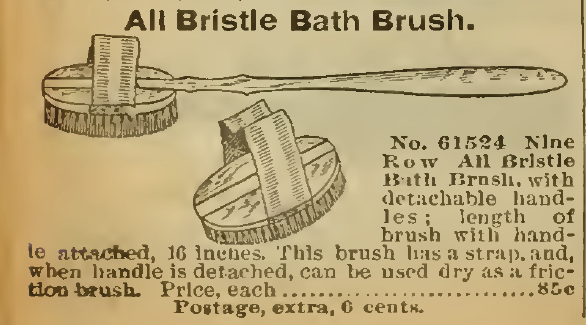 More Bath Brushes in the Sears, Roebuck & Co. Catalog, 1898. 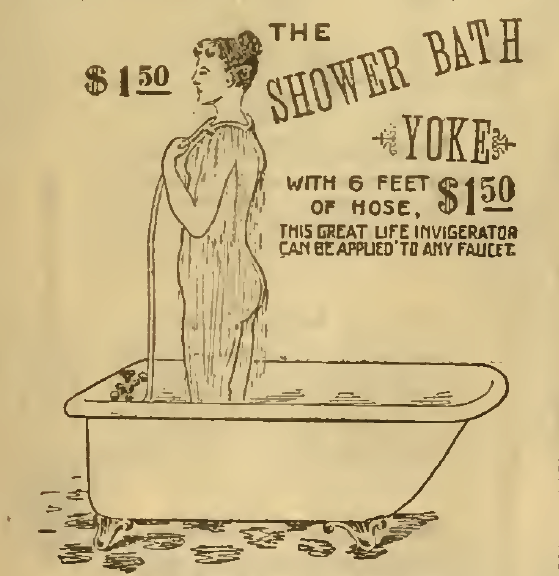 Genuine Florida Water for scenting the bath, for sale in Sears, Roebuck & Co. Catalog, 1898.